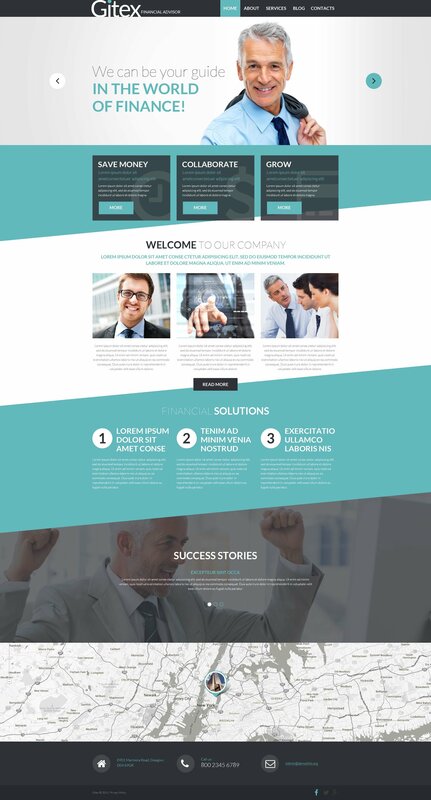 If you are looking for a flat-style theme that would give your agency website a professional look, then you should consider this Financial Advisor WP Template. Contrast of blue, gray and white adds a formal tone to the theme's design. Three blocks under the top slider with the icons on the background layer can be a nice solution to stimulate users interest in your services. Tilted lines separate content in a rather unusual manner. At the bottom of the page visitors can find a Google Map to locate your agency and contact information to get in touch with you. Responsive design , SEO optimized code and WPML integration of this theme will let you reach every web surfer interested in your recommendations. Responsive design means properly adjusted to the screens of all sizes on any gadget. Responsive design is the reason why the website will provide an excellent browsing experience to all users across all gadgets. MotoPress Slider can be an easy to use solution to put together eye-catching slides with fantastic design. It offers you with the ability to construct professional-looking slides of pictures, videos and text by means of animation effects. Portfolio web themes offer you an organic, oftentimes tiles-form pattern. These themes are used to coordinate any type of art form. It serves as a completely independent means of advertising. Any web site surfer can observe your works and projects. You can attract customers and operate without intermediaries - consumers on their own will come to you. Parallax is a scrolling technique in which front designs move around in a different tempo than the back ground ones. Animated effects make the site more vibrant and also attractive. Parallax is a type of present day trend, so that using it at your own site not simply helps it be more attractive but additionally better looking. Retina Ready is a kind of display screen that shows more pixels per square inch. Being Retina Ready your website becomes accessible from Apple products which extends the amount of prospective clients. Bootstrap is an open-source framework for webpage and applications design. Using the Bootstrap, you can make 100 % responsive website pages by means of HTML and CSS based themes for typography, print styles, forms, buttons, tables, and many more. The Search Engine Friendly website helps any searcher to crawl every web page of the internet site, define the information and index them in the repository. With it, it is possible to attract lots of targeted customers to the web page from search engines. It does a revolution in the field of drag-and-drop functionality. It changes the default WP editor with a visual editor, which can be really user-friendly, intuitive and perfect for newbies. It's easily expandable, entirely responsive and operates effortlessly with all WP designs. Newbies are going to be glad. Is it possible to use your WordPress themes for Business Journal to develop websites for my customers? Yes. It is perfect for designers who want to offer their customers a high-quality design and also save time and money. Keep in mind that when you purchase the WordPress template for Business Journal with ordinary or exclusive license you're entitled to create only one project (one domain name). Are there any limitations on selling the WordPress template for Business Journal as the integral part of my new product? I would like to make payment for WordPress template for Business Company by company check. Is that possible? Please use Skrill payment option. They accept payments by check.You can place an order for WordPress template for Business Company on the site under the name of the company and choose Skrill merchant system for making payment from the company's account. To initiate bank transfer, please create an account here - www.skrill.com, add the number of your bank account and verify it. After that, you can place an order on our website and choose Skrill on checkout page. When the payment is made, the product will be sent to your e-mail along with the invoice under the name of your company. Is it possible to buy the particular image from the WordPress design for Businessman ? No. According to our Terms and Conditions we never sell the images separately from WP templates for Business Magazine (as well as the templates separately from the images). Will the Small Business WordPress design theme be deleted from TemplateMonster database? No, the Small Business WordPress design theme will not be deleted from TemplateMonster database. What is a buyout purchase license for Business Bureau WordPress theme? If you purchase the product at a â€˜Buyout price' it guarantees that you are the last person to buy this template from us. It means that this Business Bureau WordPress theme may have been sold before a couple of times (see â€˜Downloads' number in item's properties) but only you and people who bought the template before you will own it. After this kind of purchase the template is being permanently removed from our sales directory and is never available to other customers again. The buyout purchase license allows you to develop the unlimited number of projects based on this template, but the template should be customized differently for every project. What are the advantages of purchasing a WordPress design for Business & Services? The major advantage of purchasing a WordPress design for Business & Services is price: You get a high quality design for just $20-$70. You don't have to hire a web designer or web design studio. Second advantage is time frame: It usually takes 5-15 days for a good designer to produce a web page of such quality. Can I customize the WordPress design for Business & Services? Yes, you can customize the WordPress design for Business & Services to any extent needed. You cannot use a header of the template for one project though, and images from the template for the other project. Can I use graphics from WordPress design for Business Magazine I purchased for use in printing? Yes, it's not prohibited to use the WordPress design for Business Magazine graphics for printed material, but the resolution of the templates graphics ( except for logo templates) is not enough for printing. What will I see instead of the images after installation of the Corporate WP theme? After Corporate WP theme installation you will see blurred images included for demo purposes only. Are there any restrictions for using imagery, cliparts and fonts from the WordPress template for Business News I purchased? All imagery, clipart and fonts used in WordPress template for Business News are royalty-free, if not stated otherwise on the product page, and are the integral part of our products. One Time Usage License and Developers License give you the right to use images, clipart and fonts only as a part of the website you build using your template. You can use imagery, clipart and fonts to develop one project only. Any kind of separate usage or distribution is strictly prohibited. Can I resell Business Bureau WordPress designs I bought the developers license for? You cannot resell the customized Corporate WP theme as a template, but you may sell it as a project to your client. Can I put low resolution thumbnails of WP templates for Business on my website for my clients to choose designs? Can I customize the WordPress template for Business Journal if that's required by application settings? Yes, you can customize the WordPress template for Business Journal code, graphics, fonts to any extent needed. How can I modify WordPress design for Business Firm to suit my particular website? Please visit our Online Help Center to obtain detailed instructions on editing WordPress design for Business Firm. In what cases I don't need the extended license for Business Firm WordPress designs? Can I resell the Business WordPress theme as is? No, you cannot resell the Business WordPress theme as is. Can I put a line at the bottom (or any other spot) of my new product "Website development by Company name" after purchasing WordPress template for Business Company? Yes, you can place a note at the bottom (or any other spot) of my product "Website development by Company name". Nevertheless, you cannot place "Website design by Company name"while using one of WordPress template for Business Company. I like the image from the WordPress template for Business Company and would like to use it for my advertising campaign, can you send me this image in a higher resolution? No, we can't provide image in higher size or resolution rather than it is on the WordPress template for Business Company. We recommend looking for professional images on online photo resources. Can I put a line at the bottom ( or any other spot) of the customized Small Business WordPress design theme "Website design by Company name"? No, you cannot place a line at the bottom ( or any other spot) of the customized Small Business WordPress design theme saying "Website design by Company name". Nevertheless, you can place "Customized by Company name". Can I apply a discount code to a discounted WordPress design for Businessman or combine several discount codes together to get better price? I ordered a WP template for Services but haven't received the download information. In case of not receiving the download information of a WP template for Services, please contact our Billing Department via support chat by phone or e-mail. What is GNU GPL v3.0 license and can I use it with WordPress design for Business & Services? If you buy a WordPress design for Business & Services released under GNU General Public License v3.0, you can use it on any number of projects belonging to either you or your clients without any limitations. This license allows you to modify the template and its sources to suit your needs. Will TemplateMonster help me to edit my Small Business WordPress design theme? TemplateMonster offers you a variety of sources to help you with your Small Business WordPress design theme. Use our comprehensive Online Help Center to get the basic knowledge about your Small Business WordPress design theme. Our Knowledgebase contains customers questions and most frequent problems. Anyway, you can always use TemplateMonster 24/7 phone support, try our Ticket System or Live Support Chat to get qualified assistance from our support representatives. What is the difference between unique and non-unique Business Company WordPress design purchase? Non-unique purchase:Non-exclusive purchase means that other people can buy the Business Company WordPress design you have chosen some time later.Unique purchase:Exclusive purchase guarantees that you are the last person to buy this template. After an exclusive purchase occurs the template is being permanently removed from the sales directory and will never be available to other customers again. Only you and people who bought the template before you will own it. Can I get the extended license for some other pricing than the half of the initial Business Company WordPress design price? No. The price for purchasing license for a single Business Company WordPress design is the half of the template unique price. What is a one time usage license for a WordPress template for Business News ? When you buy the WordPress template for Business News at usual price you automatically get the one time usage license. It enables you to use each individual product on a single website only, belonging to either you or your client. You have to purchase the same template again if you plan to use the same design in connection with another or other projects. When passing files to your client please delete the template files from your computer. What is Extended License for Business Bureau WordPress theme? Can I integrate the Small Business WordPress design theme with third-party software or applications for development of my new products? No, you cannot get the developers license for development of Small Business WordPress design theme or other products. Is it reasonable to make unique purchase of WordPress theme for Business Blog that was already purchased before? Yes, it's reasonable to make a unique purchase of WordPress theme for Business Blog . Because there is very small chance that you will find the same design on the net. There are more than 3,000,000,000 webpages online now according to statistics on www.google.com. What is a unique purchase license for WordPress design for Business Bureau ? If you purchase the product at a â€˜Unique price' it guarantees that you are the first and the last person to buy this WordPress design for Business Bureau from us. It means that this template has not been sold before and you become an owner of a unique design. After this kind of purchase the template is being permanently removed from our sales directory and is never available to other customers again. The unique purchase license allows you to develop the unlimited number of projects based on this template, but the template should be customized differently for every project. Is it possible that Template Monster will contact my client which website I made from Template Monster's website WordPress design for Businessman ? Yes, our legal department checks licenses regularly. In case we won't find designer's contact information on the site which was made from the WordPress design for Businessman of ours we will contact the owner of the site directly. I have customized the Business Bureau WordPress theme and would like to protect my content by copyright, can I place Copyright, Mycompanyname.com? After Business Bureau WordPress theme purchase you can put your copyright to the template. But you cannot place a line at the bottom (or any other spot) of the customized project saying "Website design by Company name". Nevertheless, you can place "Customized by Company name". Are your Small Business WordPress designscompatible with any CMS? Can I resell the customized WordPress design for Business & Services? Yes, you can redistribute WordPress design for Business & Services under the terms of the GPL as well. Is it possible to reactivate my download link for Business Bureau WordPress theme if it was deactivated after 3 days? Yes. Please re-activate the download link for Business Bureau WordPress theme within your account under the Downloads tab or contact our billing department directly regarding that. We were invited to develop the website of one of the Laboratories of the University of S&atilde;o Paulo, onde of the most important Universities in the South America and during briefing and plaining what to do one important point was to define the language for the site. Since this client had already contracted us to develop the website for a Symposium a couple of years ago and we bought one template from Template Monster, we decided there would be the right place to look for another template. In contact with support we were presented to Monstroid that fit exactly our needs. We bought Monstroid and started the first part (1/3) of the project, that has the perspective to be huge and to be a great way to get known in the academic environment, so it needs to look great. The most important of all is that the layout correspond to the client expectations in its functionality and design. Monstroid is a very stylish design with great capabilities, intuitive and simple navigation. Other major strength of Montroid/Template Monster is the great team providing support for the developers, all well qualified professionals available to help us user at any moment. We are really pleased with the results of this project and our plans include the development of other laboratories`s websites with Monstroid and other templates. We do really recomend Template Monster as your primary source of templates, we had never regret our aquisitions in Template Monster. Congratulations to the whole team of developers and consultants that create great templates making it easier to work with high quallity tools and resources. I am a web developer and needed to find a template for my client&#039;s new business. They run a property tax consulting agency for high end corporate clients who wish to dispute their property tax assessment. The reason I chose this template was: 1) The template fit the theme of my client&#039;s new business 2) WordPress CMS makes it easy to make changes and add important plugins (e.g. appointment calendar). 3) Not only looks clean and modern but maintains responsive design. Having a fully responsive design was very important to my client, My client is now using this template (after my changes and additions) and is quite pleased. I would recommend this to whomever is reading this review. Additionally, when I had coding queries, questions about WordPress shortcodes, or possible template bugs, TemplateMonster live support (chat and support ticket) was eager to help with my issues. I&#039;m sure there are those who have bought templates elsewhere, discovered bugs only to find the author unresponsive. Well, not so at Template Monster. Their technical support is unparalleled in this industry. They are available 24/7 and will not only help you with any problems but with minor coding as well. example: CSS how-to questions. For both templates and support, I will always recommend Template Monster! This template has everything we were looking for. I saved a lot of time because the design was perfect for my needs. My content fit perfectly into it without tweaking the theme. Easy to change the main color of elements. (change green to red). My client already loves his new website and show it to everybody. I recommend it, top quality template and top quality design, very appreciate working with this one. If you love bootstrap then this theme is the right for you. It is easy to install on wordpress. If you need to translate that to another language then you will be happy, because it is really simple. I have bought this template for a customer of mine, after having tried the parent template from Monstroid. Because the Monstroid template really lived up to its expectations, I hoped this template would do also. However I find it far less customizable en more difficult to implement. All the added options in styles from Monstroid really seems to be lacking in this one. Trying to customize this template is really quite a challenge, compared to its parent theme. A real pity. Using the Glitex Wordpress Theme from TemplateMonster was my first time stepping into the Wordpress world. It was super easy to use and any questions I had where immediately answered by the support team. This was my first but definitely won&rsquo;t be my last time using TemplateMonster. It was so easy and customizable. I purchased the Giltex Wordpress theme. I loved the fact that it has a &ldquo;stacked&rdquo; design, perfect for mobile sites. I liked the &ldquo;movement&rdquo; that it offered in the slider, adding visual interest. I also liked the stylish flat design, It seems very modern and up to date. I am a developer, but love the ease of all the Template Monster templates. I have down loaded around 10 different templates. Even though this template was created for a financial institute, I used it for an Attorneys office. They had an old website and wanted something modern and stylish, when I showed them this design, they automatically loved it. We changed the color scheme a little but still stayed with in the blue family. I am a small business owner and I was looking for a new website. I was going to use a service but I figured I would give it a shot on my own first. The templates on TemplateMonster were very professional looking and exactly what I wanted in a website. I purchased a template and had TemplateMonster load it for me on my hosting service. The site was up and running in a matter of hours and they even gave me some help with the updates. Overall I am very satisfied with my purchase and would recommend TemplateMonster to anyone else who is looking for an easy to use, professional-looking website. This theme is very easy to work with and looks great. It comes with a clean and modern design and would recommend this for anyone looking for a stylish business website. Installed like a dream and works like a charm. I build websites for a living and like how easy to use this template is&hellip;.also it looks awesome! Love this template! Is it possible to change the colors to customizable colors? Single Site License $79 Single Site License for the template grants you a non-exclusive permission to use the template on a single domain/project. Developer's License $148 Under Developer's License you are granted a non-exclusive permission to use the template on up to 5 domains. $149 $99 If you are a web designer or a web developer and want to use this template for several of your clients' websites, you may get 5 Additional Licenses for your Single Site License. 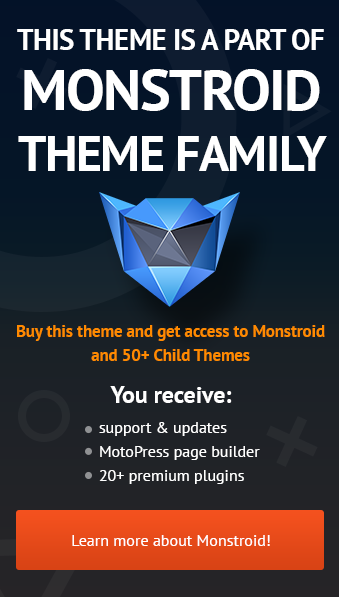 Under this offer you are granted a non-exclusive permission to use the Monstroid Theme on up to 5 domains. Non-exclusive permission means the template will still be available for purchase on our website and other clients will be able to buy it. Additional Licenses don't include customization/installation services for other domains the license covers. You may order services for every additional domain separately after the purchase.